Publications in peer-reviewed journals as well as oral and poster presentations for scientific conferences comes under the purview of GPP3 guideline. The GPP3 has kept pace with the changes in publication practices and focusses on every burning aspect of publications. The present paper evaluates the purview of GPP3 guideline in context with the evolving role of medical writer (MW) in the present times. A MW plays an important role to in producing high quality authentic documents. The role of professional MW have previously been emphasised upon in previous versions of GPP guidelines, and have been instrumental in acknowledging role of MWs in medical publications and cementing their existence rather than them being termed as 'ghostwriters'. Additionally the paper focuses on evolving publication and research presentation standards with reference to other guidelines. The paper also focusses on clarity on reimbursements which is in contrast to other Acts (Sunshine Act). Most importantly, the expectations from subsequent guidelines are also discussed which may form basis of subsequent GPP guidelines. Purpose: Plagiarism is a type of research misconduct that consists of copying other's work or ideas without giving them proper credit. The rise of plagiarism cases has become a serious concern in the scientific world. Hence, a cross-sectional survey was carried out to assess the attitude among dental faculty members and postgraduate (PG) students toward plagiarism. Objectives were to compare the attitudes of dental faculty members and PG students toward plagiarism and to analyze the association of attitude toward plagiarism (ATP) with age, gender, and number of publications of the participants. Materials and Methods: ATP was measured using a self-administered questionnaire consisting of two sections; first section consisting of demographic details of the participants and second section consisting of the ATP questionnaire measuring positive attitude, negative attitude, and subjective norms. Ninety faculty members and 126 PG students from four dental institutions participated in the study. The data were analyzed using Chi-square test and linear regression analysis. Results: PG students showed more positive attitude and less negative ATP as compared to faculty members. Positive ATP decreased with increase in age (β = −0.147; P = 0.008), number of publications (β = −0.195; P = 0.001), and from males to females (β = −1.209; P = 0.044) whereas negative ATP increased with age (β =0.093; P = 0.001). Conclusion: The study showed negligence of PG students toward plagiarism which calls for improvement in awareness regarding plagiarism and research education. Context: Adherence to good clinical practice (GCP) guidelines by the researcher provides public confidence that the rights, safety and well-being of human participants involved in research are protected. It has been observed that researchers require basic GCP training. Considering this, we had decided to conduct a training session on overview of GCP. Aims: To strengthen the knowledge and awareness regarding GCP. Settings and Design: The design of the study was quasi-experimental one group, pre-test and post-test design and the study was conducted at ACTREC among healthcare professionals at Tata Memorial Centre. Methods and Material: A semi-structured questionnaire was used to collect the data in pre and post-test. A total of 138 participants were participated in the study. The training session was pre-planned which included a lecture followed by the question-answer session. Statistical Analysis Used: Wilcoxon Signed Rank test was used to assess the effect of the planned teaching programme. Macnemar test was used for item wise comparison of pre and post-test scores. Mann Whitney test was used to determine the significant difference between knowledge scores and selected demographic variables. Results: This study has resulted in overall improvement of knowledge with a median difference of 5 with P-value <0.001. 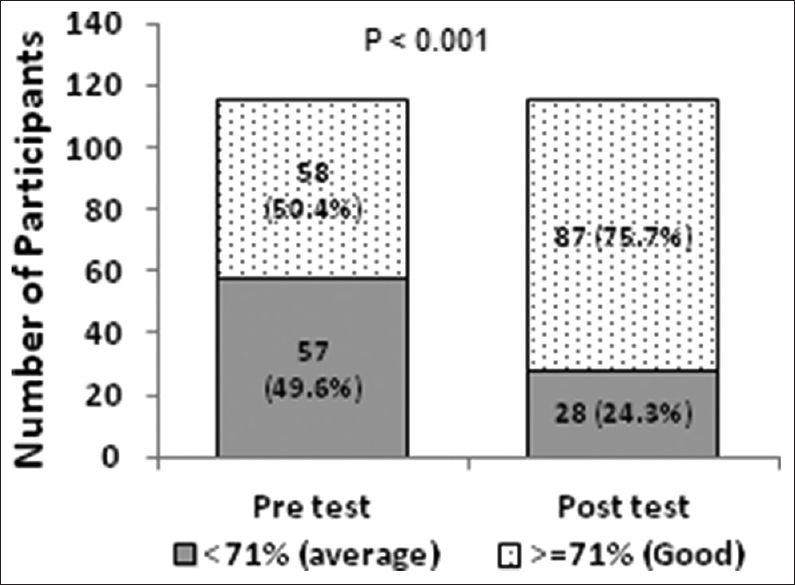 There was a statistically significant improvement of knowledge between pre and post-test of those having GCP training in the past, working group and education. Conclusions: The exercise of holding training program was found to be significant in improving the knowledge base of participants, especially investigators and study coordinators. Background: The Clinical Trials Registry of India (CTRI) was launched in July 2007 and will enter its tenth year in 2017. While its mission is to encourage prospective trial registration, CTRI does permit retrospective trial registration. Against this backdrop, the present audit was carried out with the primary objective of assessing the nature and extent of trials retrospectively registered with CTRI. 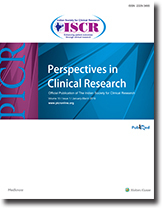 Methods: All studies registered in the year 2016 were searched within CTRI using the keyword “CTRI/2016.” The total number of trials registered in that year, their phase, the source of funding and their nature (Interventional or observational; whether postgraduate theses or otherwise, source of funding (pharmaceutical industry/Government of India/Institute Funded), whether prospectively or retrospectively registered were noted. We also tested for the association between the nature of the trial and retrospective registration using the Chi-square test and generated crude odds ratios with 95% confidence intervals. Results: A total of 1147 studies were registered in 2016, of which 719 (63%) were retrospectively registered. Interventional studies formed the majority of studies at n = 926 (81%), while postgraduate theses constituted half of the studies (384; 53%). Postgraduate theses (relative to all other studies) were twice as likely to be retrospectively registered (cOR 2.4 [1.8, 3.0], p < 0.0001). Studies funded by the pharmaceutical industry were four times more likely to be registered prospectively relative to nonindustry funded studies (cOR 4.4 [3.2, 5.9], p < 0.0001). Conclusion: Given that CTRI will be insisting on prospective registration effective April 1, 2018, and as trial registration is an ethical, scientific and moral imperative, prospective registration must always be done as prerequisite to participant protection. One of the first steps in planning a research study is the choice of study design. The available study designs are divided broadly into two types – observational and interventional. Of the various observational study designs, the descriptive design is the simplest. It allows the researcher to study and describe the distribution of one or more variables, without regard to any causal or other hypotheses. This article discusses the subtypes of descriptive study design, and their strengths and limitations. English, the most widely used and accepted language worldwide, is also the dominant language in scientific writing. To ensure that a publication has a wide reach, it should be written in a simple and concise manner, which requires a good command over the English language. However, this is an area of challenge for most medical writers in India. This article includes tips and tools that will help medical writers overcome these challenges, which will aid in better understanding of the audience and easier publication process.